Osteoarthritis, known as OA, is a condition causing joints to become painful, stiff and possibly swollen. It is the most common form of arthritis; another form is rheumatoid arthritis. OA most often affects knees, hips and small joints of the hand, and its severity can vary between different joints, and over time can fluctuate in the symptoms it causes. OA becomes more common with increasing age but can occur in younger individuals i.e. less than 50 years old if there is previous history of injury or trauma. 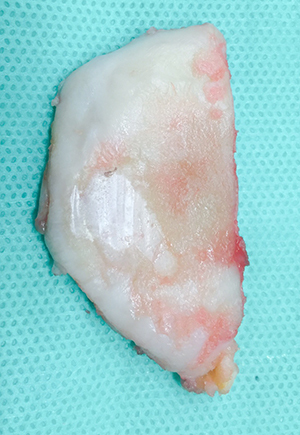 The disease process is a loss of the smooth cartilage coating of bone which normally allows joints to move freely. 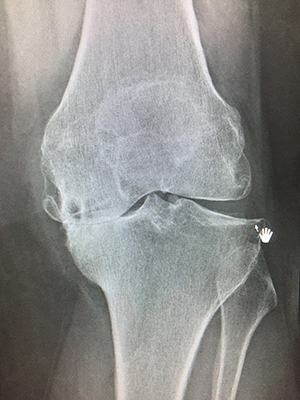 Early OA is the thinning of this articular cartilage leading to roughness and irritation of the joint and early symptoms. Once the articular cartilage is lost completely, bare bone is exposed and causes pain and stiffness, with extra bone being formed to try and spread the load. The loss of cartilage can cause the joint to become deformed and in severe cases- unstable. Management of osteoarthritis should be multifaceted with use of analgesics, anti-inflammatories and weight loss when required. Braces may be available to offload a diseased area of bone – Mr Flynn has close ties with representatives from bracing companies to provide a personal fitting and delivery. Interventional options range from injections into the joint, arthroscopic treatments, osteotomies (realigning the leg), partial knee replacement, or combination of partial knee replacements – commonly termed a boutique or bespoke knee. If a whole joint is affected by arthritis, then total joint replacement maybe required.